For those that enjoy a side of sports with their meal you should drop by Winchell’s for a meal and a game. Think Buffalo Wild Wings, but tone down the volume and give it a more family friendly, localized appeal. The decor is pure Kentucky: horse racing, Keeneland, jockeys and the UK Wildcats in general. Why mess with a good thing. I hadn’t been to Winchell’s previously. I was looking for something casual that wasn’t a chain restaurant, and had the space and atmosphere that I could bring three kids and not have to worry about how close we were to other diners, or that the kids may play around some and make noise like kids often do. Winchell’s was perfect for this. We were given a huge booth in a corner with a pristine flat screen television within optimum viewing range. There is plenty of room between tables and coloring sheets with crayons were provided upon being seated. 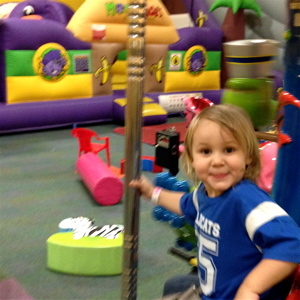 Isabella at Monkey Joe’s rocking the Merry-Go-Round. I had just come from Monkey Joe’s with the 2-year old and 10-year old, so they had some hyper kinetic kid energy surging, even though they had run much of that out of their systems. Still, you never know how they will respond to being placed at a table and expected to chill and behave. They did fine, but it’s nice to have some ambient sports noise as a background to blanket the stream of consciousness chatter. Winchell’s has a large raised platform bar in the front that is a natural for sitting around and watching the Cats play ball. It instantly feels like an extension of your living room. Regulars are chatting NCAA strategy over cold, local craft beers like Country Boy Brewing, Kentucky Bourbon Barrel Ale, and West 6th. 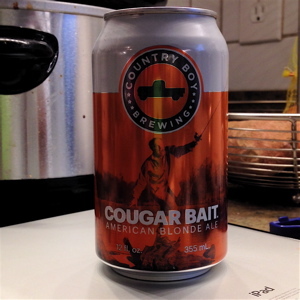 A current local favorite of mine is Cougar Bait from Country Boy Brewing, which Winchell’s has on tap. The cuisine is classic Southern-style comfort food: shrimp & grits, fried chicken, catfish dinner, chicken livers and a hot brown for example. My 11-year old said the fried chicken was better than KFC’s, which is saying something coming from a kid. Though Winchell’s is known for its fried chicken. I opted for a taste of Pittsburgh by sampling the Winchell’s Brothers sandwich. 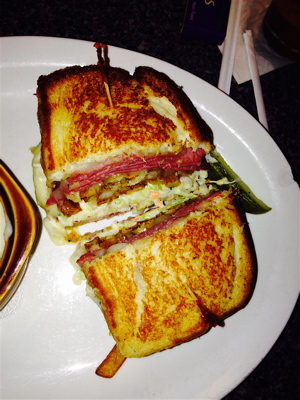 It’s a take on the classic sandwich style from Primanti Bros. You take corned beef, tangy cole slaw, Swiss cheese, tomato and add a healthy portion of fresh cut French fries on the sandwich with everything else. It’s a big sucker under two pieces of toasted bread, but tasty. Plenty to satisfy a steel worker or hungry basketball fan. The Funny Farm sandwich was also impressive with its country fried pork chop topped with country ham, bacon, a fried egg and pepper jack cheese. It comes served on a toasted Kaiser roll. The Reuben was yummy as well. Most sandwiches and entrée items are between $9-$14. There is a kid’s menu too. The waitstaff was great, and they took excellent care of our crew throughout. Winchell’s is the creation of Eric “Abe” Lansdale and Graham Waller, both 1992 graduates from Henry Clay High School in Lexington. After completing their studies in 1997 at the Culinary Institute of America in Hyde Park, NY, Abe and Graham traveled extensively throughout the U.S. working with some of the best chefs in the world. These two great friends have returned to their hometown to open a restaurant and sports bar that serves fresh, homemade food in a casual and friendly environment. Winchell’s is located in one of the numerous generic strip malls along Southland Drive. If you need a landmark, watch for the Oleika Shrine Temple (which is impossible to miss). Winchell’s is next door. Come by for some comfort cooking and watch the Kentucky Wildcats on their march to Championship No. 9. 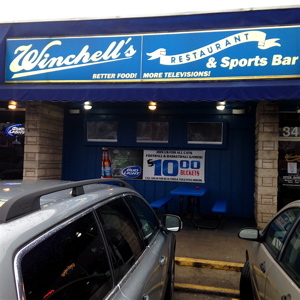 This entry was posted in Family, Food, Liquor, Reviews and tagged Cougar Bait, Country Boy Brewing, Winchell's. Bookmark the permalink.